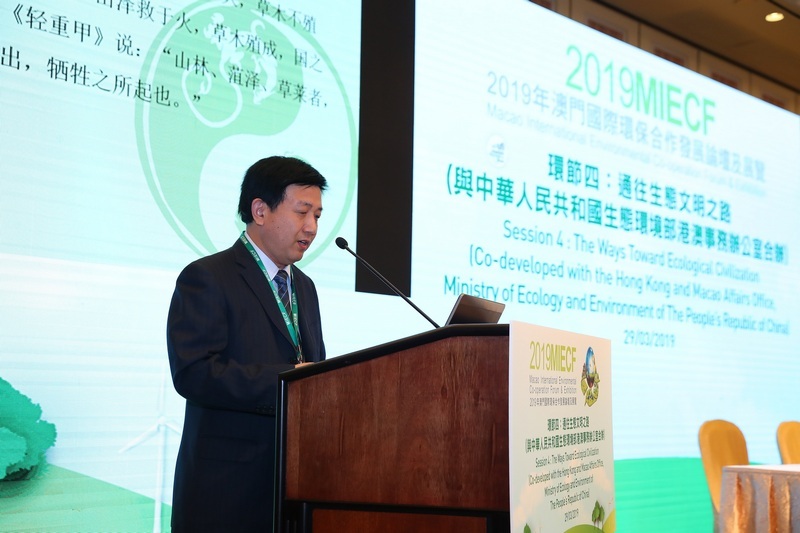 Hosted by the Government of the Macao Special Administrative Region, the “2019 Macao International Environmental Co-operation Forum & Exhibition” (2019MIECF) concluded successfully today (30 March). During the three-day event, a total of 44 agreements were signed and a total of 350 business matching sessions were held at the Green Matching Area. The Opening Ceremony and a series of forums held during the three-day event attracted more than 4,700 participants. The 2019MIECF was supported by the National Development and Reform Commission, the Ministry of Science and Technology, the Ministry of Industry and Information Technology, and the Ministry of Ecology and Environment of the People’s Republic of China, co-organised by the governments in the Pan-Pearl River Delta Region, and co-ordinated by the Macao Trade and Investment Promotion Institute (IPIM) and the Environmental Protection Bureau (DSPA). This year’s event was themed “Promoting Ecological Civilization and Green Development”. The 2019MIECF offered the Green Forum and the Green Showcase. A total of eight green forums were held, together with one keynote speaker special session. This year’s MIECF had the honour to invite Mr Michael Liebreich, Founder of New Energy Finance, former Chairman of the Advisory Board at Bloomberg New Energy Finance and Senior Contributor, and Chairman and CEO of Liebreich Associates, as the keynote speaker. In addition, a fantastic array of forums were joined by about 70 guests from Mainland China, the Netherlands, Portugal, Timor-Leste, and Britain, as well as the Guangdong-Hong Kong-Macao Greater Bay Area, including pioneers of environmental protection, senior leaders of multinational corporations, and policy makers. 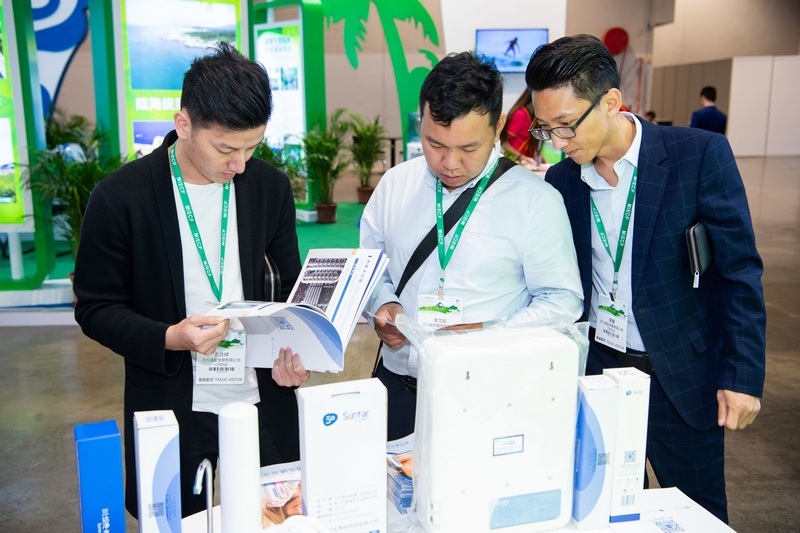 Covering a total area of about 16,900 square metres, the 2019MIECF was joined by over 500 exhibitors from Mainland China, “Belt and Road” countries, European countries, and Portuguese-speaking countries. 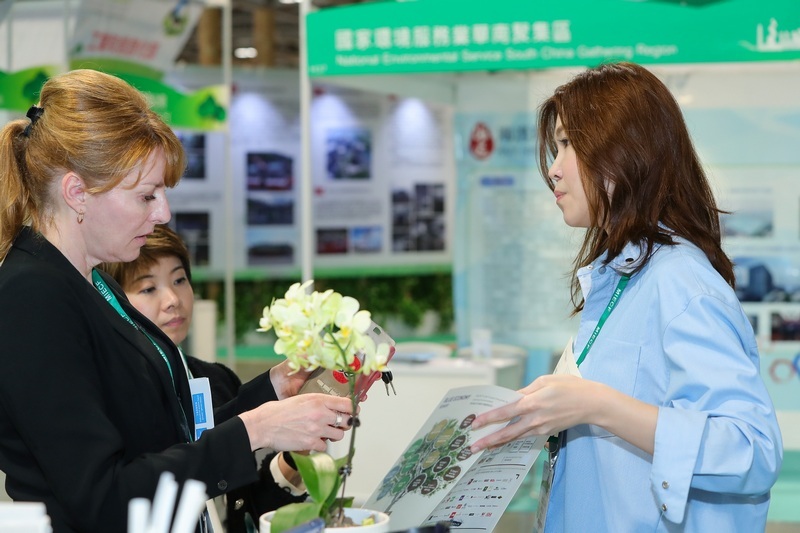 This year’s MIECF offered the “Greenovation Zone” for the first time, expanded the area of the “Greater Bay Area Eco-Products and Solutions Pavilions”, and continued to offer the “Green Building Area” for participants to adapt better to national policies and seize opportunities of green development worldwide. Additionally, a guided tour was organised for delegates from over 30 government departments. A special government procurement matching session was also available on the afternoon of the second day of the 2019MIECF. The final day of the 2019MIECF was the “Green Public Day”, which witnessed a large flow of visitors who participated in a series of family eco-activities and enjoyed a variety of performances in the bustling atmosphere. During this year’s MIECF, technical visits were organised for guests to the Macao Electronic Waste Recycling Treatment Facility and the Hong Kong-Zhuhai-Macao Bridge & Macao Port for them to learn about local efforts to promote environmental protection and the development of infrastructure. On the last day of the 2019MIECF, another visit was arranged for participants, including the public, to the Macao Electronic Waste Recycling Treatment Facility. 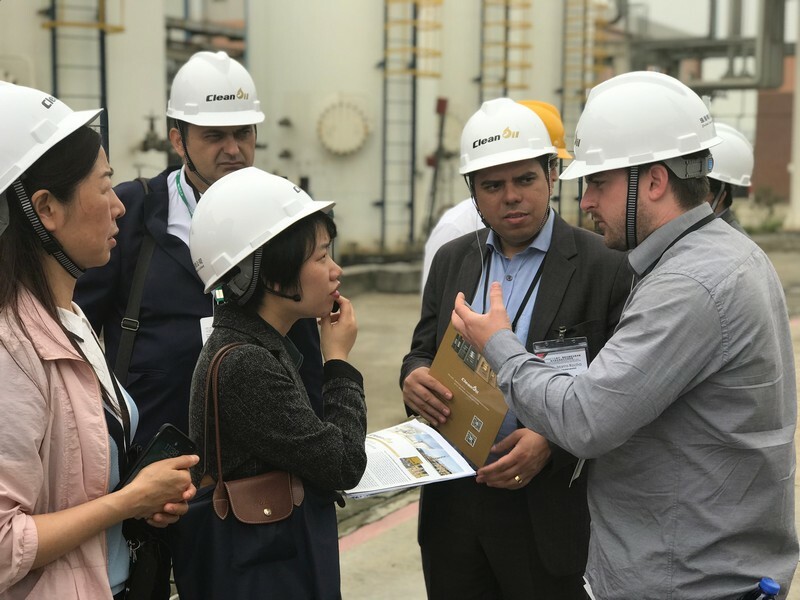 In addition, a tour was organised today (30 March) by the Macao Trade and Investment Promotion Institute (IPIM) for a total of 25 traders participating in the 2019MIECF, especially those from Portuguese-speaking countries, as well as representatives from the local environmental protection industry, to inspect environmental projects and technologies of green companies in the city of Zhuhai, Guangdong province, with the aim of learning about local facilities and projects relevant to environmental protection such as those involving waste disposal, biomass thermal engineering, and unmanned ship technology to promote exchange and development of different parties. An enterprise representative showed interest in the waste oil regeneration technology in Zhuhai, saying that the company would explore the possibility of supplying Zhuhai with waste oil collected from Macao as raw material. In addition, a Brazilian company pointed out Brazil’s interest in China’s waste disposal technology, adding that he was pleased to participate in the inspection tour to exchange ideas with relevant companies and that his company is exploring the possibility of introducing China’s waste disposal technology into Brazil. Meanwhile, another city tour was also arranged by IPIM for traders to visit Macao’s Central District and participate in the activity “Let’s Hang Out – Lusophone and Macao Products Bazaar”. Jointly hosted by IPIM, the Macao Association for Promoting Community Economic Development, and The Industry and Commerce Federation of Macau Central and Southern District, and co-organised by the Permanent Secretariat to the Forum for Economic and Trade Co-operation between China and Portuguese-speaking Countries (Macao) and the China-Portuguese-speaking Countries Federation of Entrepreneurs, the activity allowed traders to have a first-hand experience of Macanese culture, and at the same time, promote development of community economy. Thanks to the continuous improvement of the quality and professionalism of its activities, the MIECF has grown into an international eco-event of profound importance since its debut 12 years ago. Apart from recognition by the Global Association of the Exhibition Industry (UFI) as a “UFI Approved Event” in 2011, it was also granted the “Excellence Conference and Exhibition Award” of Macao in 2017. Mr. Zheng, a manufacturer of glass solar energy generators from a country along the Belt and Road, revealed that he had promoted the company’s products in the Mainland in the past but failed to achieve the expected results. At this exhibition, he expected to co-operate with the Macao Chamber of Commerce and utilize the platform of Macao to sell the products to the Mainland. He was confident in the co-operation and believed that Macao’s familiarity with the mainland would help the products penetrate the mainland’s market and cater to the actual needs of different consumer groups. Mr. Wang, an exhibitor from the Guangdong-Hong Kong-Macao Greater Bay Area, said that it was the company’s first time to exhibit in Macao. The company mainly sells gasoline products, with a unique formula to reduce emissions. For him, the results of this year’s exhibition were unexpected. Besides trade visitors from Hong Kong and Macao, there were also mainland and Malaysian visitors who were interested in his products. The exhibition not only increased the exposure of the new products, but also enabled him to establish contacts with different institutions and develop into a co-operative relationship. Mr. Ye, a sales and marketing manager of a building materials engineering company from Canada, participated in the exhibition for the first time. He said that the MIECF is a high-quality event beneficial to the company’s promotion. 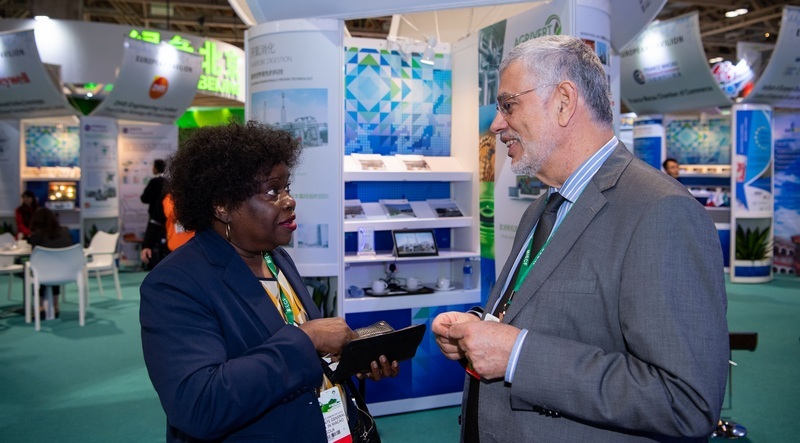 According to exhibitor Peter Barron, who is engaged in water pipe business in Australia, the main purposes of participating in this exhibition was to introduce customers to new products and to establish new connections, which may lead to collaboration or business expansion in the future. The Brazilian Chamber of Commerce organized about ten Brazilian companies of environmental protection to participate in MIECF. Mr. Chi, the head of the Chamber of Commerce, said that through the sharing of environmental protection cases and the demonstration of green products, environmentally-friendly building technology and green management solutions, the exhibition promoted exchanges and co-operation in green economy between Brazil and China. He revealed that the Brazilian delegation has conducted nearly ten business matching sessions with Macao and mainland enterprises. Some mainland enterprises were interested in investing in environmentally-friendly agriculture projects in Brazil, which involve 25 kilometers of land. He said that through the influential China-Portugal platform, Macao, both sides could understand each other’s environmental protection philosophy and strengths. 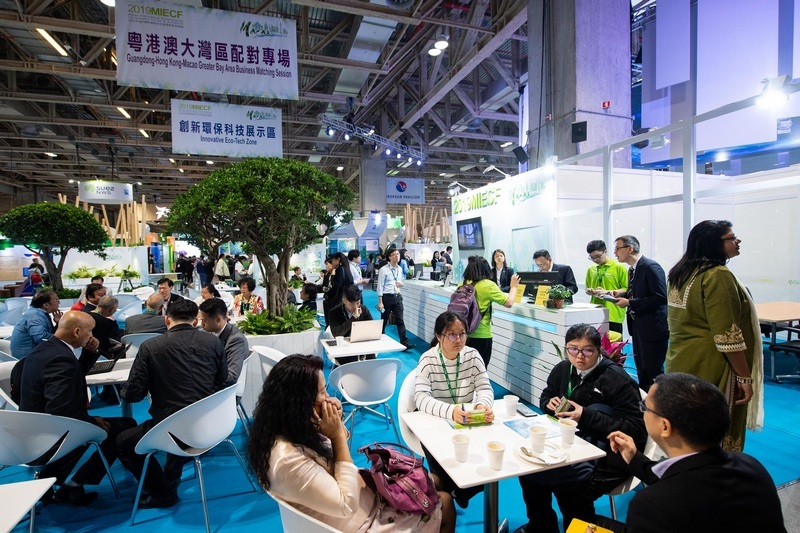 Mainland and Macao enterprises can gain an in-depth understanding of Brazil’s agricultural and forest resources, while Brazilian companies can also further understand the environmental protection industry chain in Mainland China, such as air, water quality, waste, and noise management. He said that in the future, the Chamber of Commerce will organize more Brazilian companies to participate in Macao’s exhibition, such as the 2019 Portuguese-speaking Countries Products and Services Exhibition (Macao) (2019 PLPEX), to explore business opportunities on the mainland, especially in the Guangdong-Hong Kong-Macao Greater Bay Area. Mr. Ho and Mr. Chang from local environmental protection communities said that they continued to organize members to participate in the exhibition this year. Government procurement sessions and networking session with hotel industry were held at this year’s exhibition, which greatly benefited the business exchanges of exhibitors, giving them more opportunities to promote services and products. Many companies expressed satisfaction with this exhibition. In addition, a number of agreements were signed thanks to the exchange activities during the three-day event. Mr. Kuok, the head of one of the signing companies, said that through MIECF, he successfully co-operated with mainland’s enterprises in developing Macao’s green environmental protection projects to promote the application of energy conservation, environmental protection, clean technology and other science and technology in Macao. In addition, the company participated in MIECF for the second time. He said that through the exhibition, he was able to keep the company up with the technology of local environmental protection companies and establish a co-operative relationship, and he will continue to participate in the MIECF next year. Mr. Lee from another contracting company said that three main projects were signed this time, involving sewage treatment, environmentally-friendly air-cooling machines, and product recycling. For him, it was the ninth time participating in the exhibition. MIECF is a perfect occasion, creating a co-operation platform for the environmental protection industry, especially the business matching services, allowing exhibitors to meet with preferable companies and explore business opportunities. The next MIECF will be held from 26 to 28 March 2020.